I've been experimenting with some of our "lesser" hay as mulch. It works pretty well, especially at about four inches thick, lasts longer than weed cloth, decomposes cleanly and is much, much prettier than the weed cloth in last year's photos. 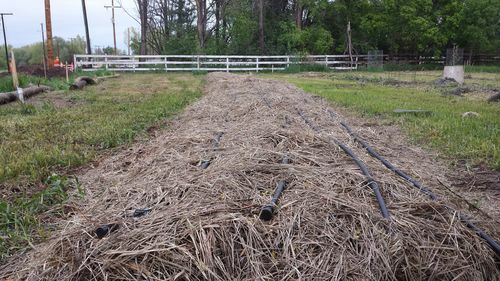 However, you might want to mulch AFTER you plant seeds and lay down drip line. Order of operations is important for ease of planting.